They'll be available at HMV I believe, I preordered a copy of the 360 game to collect tomorrow when it's released (Ireland & UK). Is there something special about the version you get with the game? 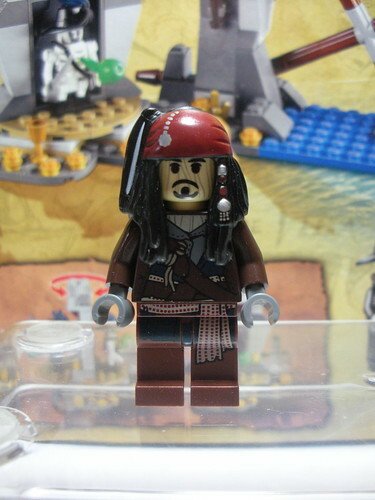 You get a Jack with every POTC set anyway and also with the NOTW on Sunday. @princedraven: Yeah, it's a special "voodoo" version... his head/face has woodgrain lines on it. Gotta say that is a good looking fig. Is it available any other way in the UK? I pre-ordered the game. Me and my sister are splitting the price. If they don't have the free figure I'll throw the game in their face and get myself arrested!!! I mean, my sister told me the pre-order list has around 2-3 names... so they're not going to tell me they ran out!!! Th woodgrain design extends to the torso, and the legs look different too, with a matching dotted pattern on the cloth near the belt, instead of the red stripes on a regular figure. I was just at Target - if you purchase the game, you get this set for free http://www.brickset.com/detail/?Set=4191-1 or a free 'sidekick'.. which is their name for a minifigure (series 4). ^ I do wonder where these people get their stock from..... Same for those selling large numbers of white Boba Fett figures on eBay. It's somewhat hard to believe that these items were legitimately obtained. I did think that about the ARF's, can you imagine if you worked in the shipping area or something and 50 of these little men just happened to accidently drop in your bag, they are tiny and there are likely 10,000 plus of them so doubt they would be noticed, selling at close on £20 each that is £1000 of little tiny plastic men!!! I want to make it clear I am in no way suggesting someone should do this (would give me less chance of getting one :) ) just saying that i wonder if that is how these end up on ebay in bulk like this. ^ We all know it happens, there is no way these people selling large quantities of White bobas/Jack Sparrows/ARF Troopers etc were obtained legitimately. Consider the ARF Trooper, the only way to get hold of him legitimately was to participate in the offer online or at a LEGO Brand store, yet someone was selling 20 online on May 4th! ^ doing it once (and getting caught, obviously!) is enough to get yourself sacked. LEGO take it very seriously indeed. They monitor all staff purchases. As an employee, you're allowed to buy for personal use, immediate family & very close friends only. It's not just TLG employees though, a lot of promotions are run at other retailers too, White Boba was at Smyths, Jack Sparrow is at TRU, I'd wager they're not as strict as LEGO. ^ Agreed. During one of the Daily Mirror giveaways, I went into a branch of WHSmiths to pick up a set and asked in passing if they had the set from the day before as I'd missed it. The guy disappeared into the back of the shop and came back with a carrier bag full of various polys from the promotion which he handed me with the words "Please take them - they're cluttering up the stock room". So really not much oversight of the distribution of these promotional items....! Sadly there will always be people in distribution chains that will always profiteer from these things. There are already people with listings on Ebay for these and the upcoming Sun/NOTW promo sets (even saying they will only be sent after a certain date once the daily offer has become available basically). Sad to see. On a seperate note and somewhat related to the topic, the Wii version of Lego POTC is currently £21.70 in Tesco's. @drdavewatford - I had the same thing happen - I went into WH Smith, got that days poly and asked what would happen to the spares, He gave me 30 more!